Certifications, Integrity, Values: Where do you stand? | Cape Project Management, Inc.
Last week I passed the Product Owner Assessment (PSPO 1) from Scrum.org (you can check out my new PSPO 1 mock exam here). As an Agile Coach and Trainer, I try to stay current with certifications. I don’t believe that these certifications necessarily make someone more effective, but for me, they are a structured way of staying current with industry best practices. As part of my long-term professional development plan, I have been thinking , “What’s next?” I had already achieved what I considered to be the core certifications for a project management consultant; PMP, PMI-ACP, PSM 1, PSPO 1, CSPO, CSP, so I wasn’t sure in which direction should I go? Should I go “big”, like SaFE or DAD (heaven forbid). Should I get certified as an Agile or PMI Trainer and pay thousands in licensing and application fees? As an independent consultant, these types of certifications become cost prohibitive. Always provide value to my customer. Stay current on best practices. Keep my expenses low so I can offer reasonable rates. Never sacrifice integrity for profitability. I considered these same values when reviewing the available certifications. Can I meet those values with my current certifications? At this point, my answer is yes. What about you? 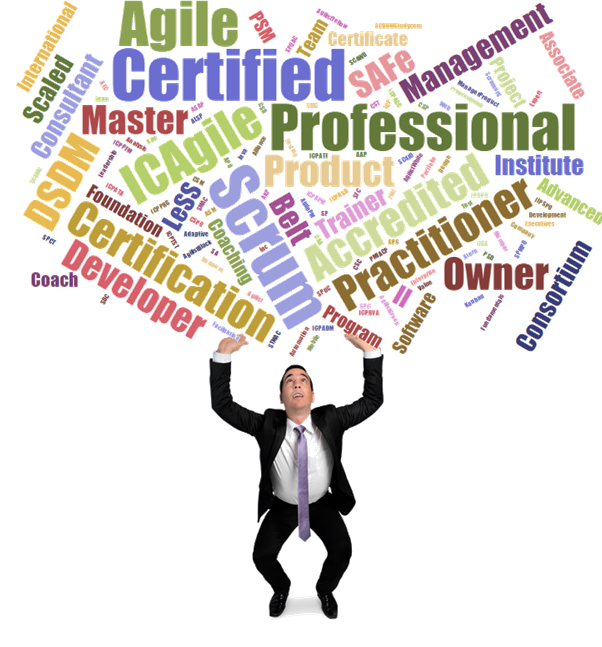 If you are interested, at my last count, there are 64 different Agile certifications! (I am sure I missed some). Can you imagine the signature line on my emails? People have different reasons for certification. Some do it to advance their careers, others to learn new skills. Yes, there are also those that use certifications to artificially represent their expertise. I don't worry about them because the job will weed out those people. Ultimately, you need to decide, based upon your professional values. Will these certifications allow me to provide more value to my employer or my customer? Once you have that answer, the decision is easy. Dan Tousignant, PMP, CSP, PMI-ACP, etc., etc., etc. Interesting take on it. I am looking to gain some additional skills and knowledge as an agile PM. I also want to prove my knowledge to my customer with an accreditation. Trying to decide which is better; ICagile or PMI ACP? This article was perfect because I’ve been struggling with the next steps and wasn’t sure if continuing to obtain more certifications were worth it. After reading that article I KNOW I want to provide more value to customers so I know what this means for me as I move forward. Being able to deliver the maximum value will lead to great opportunities by proxy. Awesome article! A refreshing and wise perspective. Lots for me to takeaway here. As a coach and facilitator I am frequently asked about which certifications and certificates I think are best (understanding that the subtext is: will this help me move my career forward?or will this help me get a job?). My response has always been, take the course/training if you want to not because you feel you have to. It is always a choice.